I LOVE them! They are just so adorable, quirky and different. They are what makes January fun for me. 🙂 Currently my classroom is filled to its gills with penguins. This adorable RESOLUTION PENGUIN is a quick and easy New Year activity. What a Catch penguins are soooo cute. This quick writing activity and craft is from the Working in a Winter Wonderland resource. Between them and the Cold Polar Bear, there isn’t a bare wall to be found! We’ve been writing our little hearts out over the past few weeks using penguins for inspiration. Expository, narrative and everything in between. Even though we write every.single.day – some of the kiddos veer toward being a copy cat rather than rely on their own creativity. This slows everything down and doesn’t lead to any new knowledge, either. It kind of drives me crazy. Kids can be WAY more creative than me. Reality hasn’t slapped a lot of them in the face yet and in their little minds ANYTHING can happen. That’s why I love narrative writing. Their stories can be so imaginative and absolutely funny. Sometimes they just need a little encouragement to stick their neck out and go for it. Before we write we usually do a read-aloud or two. I love stories that are a little out there or super silly. This leads to an awesome desire to be just as creative and funny in their own writing endeavors. If you don’t know how to use a fishing pole, you just may catch a shoe! It’s all in the details! Everyone knows a quacking duck is better than a plain old duck! That is some weird stuff! These little iceberg riding, fish catching “What a Catch! penguins are from my Working in a Winter Wonderland pack. It is equally important that the plan structure does not change with each new writing assignment. It has to remain the same so that the student doesn’t have to learn how to use a new graphic organizer AND write something well with each writing assignment. I have one graphic organizer I use for expository and another for narrative. As I’ve said here about a zillion times, writing has to start with a plan. A graphic organizer that helps the kids organize their thoughts and see the “big picture” is essential. It is also important to help them learn the process of telling a good, detailed and sequential story. Last week we wrote stories entitled Super Penguin to the Rescue! – so we used a narrative plan. That’s my plan. I always do it with them (by the end of the year, I just walk them through it). Each time we write, the process becomes faster. At this point in the year, I am only really helping 3 or 4 of my 30 kiddos with the process. Since we use Engaging Writing curriculum, this and all of our other writing projects are fairly simple for the kiddos to do. But sometimes those creative juices are just not flowing. They wait for me to do my sample and then try to copy it. Let’s face it. These are the kids who need simple sentences. They are the ones who need a lot of practice using their phonic skills. I try to encourage them to come up with sentences they can write/spell/sound out. So… I want to do examples… I don’t want copying…. Post-it Notes to the Rescue! We work on one section of the plan at a time. I talk about what part of the story goes in a particular part of our plan…come up with a few ridiculous, very LONG ideas (no idea copying allowed) and then let them make up their own. I always model the expectation for the kiddos so I write my own idea in the appropriate spot. They watch me as I talk through remembering phonic rules, spaces, capitals and punctuation. Then… I cover it with a Post-it Note. I use the Post-it Note as a word bank for words that they may want or ask to use in that section. This is done one section at a time, adding a sentence or two to a section of the plan, then covering it with a post it, then using that for a word bank. The copy cats can’t copy but are provided with the words they may be struggling with. The kids know exactly “where we are” in the plan at all times. They come up with some fabulous plans all on their own. Forced creativity? Don’t you love it when things are fun, engaging and EASY? Maybe it’s because he can have super powers and/or incredible super tools that lead all kinds of creative ideas – but my kids absolutely LOVE the Super Penguin to the Rescue! writing lesson each and every year. They cannot wait to write their final draft and create their own Super Penguin. 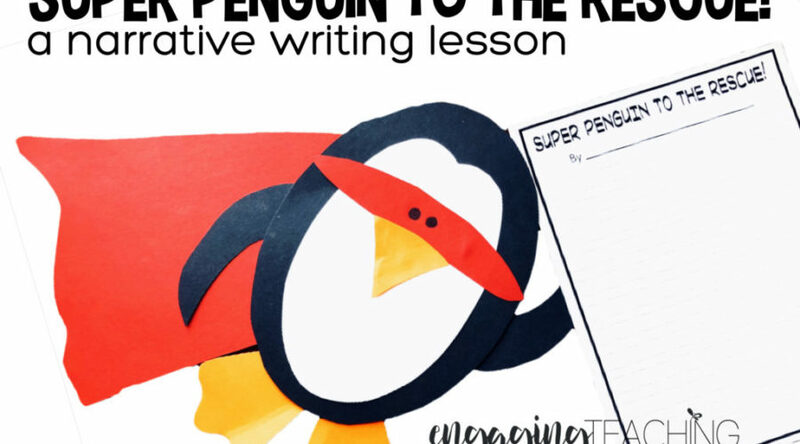 Super Penguin to the Rescue comes with detailed lesson plans and student writing plan graphic organizers. The plans are easily differentiated, too! Additionally, all of the templates for the most adorable super hero are included. You can grab the Super Penguin to the Rescue! writing lesson in my store. Click the pic below to head over and check it out. This is our last week writing about penguins. Next week we will be writing about snowmen. Enjoy the rest of your week, peeps! This is such a great idea! I'm always struggling with getting my kids to generate their own writing rather than copying my example. I love the idea of doing one section at a time, covering it up with a post-it, and writing key words that they might need in their writing. I'm definitely going to purchase this packet and implement this in my classroom tomorrow!